As most employers are well aware, employees who are classified as non-exempt under the federal Fair Labor Standards Act (“FLSA”) must be paid overtime at a rate of one and one-half their regular hourly rate of pay for all hours worked in excess of 40 hours in a workweek. As reflected above, the regular rate of pay must be based on compensation paid to an employee in the given workweek. While that may sound simple enough, it is not as straightforward as simply dividing weekly earnings by weekly hours worked. Why, you may ask? Because some types of non-standard payments must be included in the weekly compensation amount and other payments are excluded. Commissions: Commissions earned based on a set, non-discretionary commission arrangement must be included. Non-Cash Payments: For compensation not in the form of cash, the employer must compute and include the fair market value of the non-cash compensation in the regular rate of pay calculation. Non-Discretionary Bonuses: Non-discretionary bonuses must, as a general rule, be included in calculating the regular rate of pay. This could include, for example, set production, good attendance, and other similar bonuses. These bonuses must be attributed to the period of time in which they were earned in order to recalculate the regular rate of pay for those periods and, if needed, pay any additional overtime pay that is due. Certain overtime premium payments, including payment for hours worked in excess of agreed company standards. Based on all of these intricacies, calculating the regular rate of pay can be complex. Careful calculations are necessary, though, to make sure that the employer is paying the correct overtime rate to non-exempt employees. 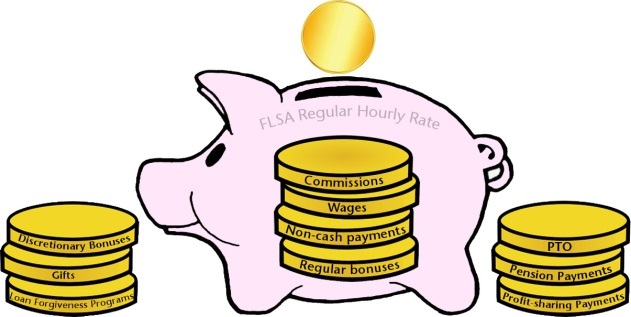 The next post in the “FLSA Fundamentals” series will tackle the sticky wicket of compensable and non-compensable working time. Stay tuned!